Someone once said he’d prefer Uriah drunk to David sober. If Stuart Olyott was asked, I’m sure he’d prefer an engaging sermonette to a boring sermon. 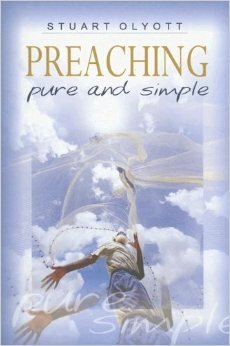 Preaching Pure and Simple is written in Olyott’s usual easy-to-understand style. He emphasizes exegetical accuracy (ch. 1), doctrinal substance (2) and clear structure. The best chapter was on supernatural authority, where the author argues that while unction is sovereignly given, it is often obtained by holy preachers who ask for it. Points of Departure: Ollyot argues that if I do not preach Christ in a sermon, not only have I not preached, but I shouldn’t preach (24). But he didn’t convince me that, for example, if I implore teens from Proverbs 5 on the dangers of adultery and the beauty of marriage but do not point to Christ that I have not preached. He says the meaning of Genesis 24 is not that God the Father brings a bride home for his Son, but it can be illustrated that way. He seems to makes too big of a distinction between meaning and illustration. Later he says that a good sermon length is 30 minutes, then for some reason tries to substantiation his point by quoting liberal womanizer/preacher H.W. Beecher. Finally he says, “the minimum you are likely to get down to [in sermon prep] is one hour of preparation for every five minutes preached.” So if I preach three 45-minute sermons per week, I must carve out a minimum of 27 hours of sermon prep time? How are the majority of Third-World pastors who work other jobs not to be discouraged by this? Millions of believers limp along in spiritual weakness because they have never understood that it is impossible to make any real spiritual progress without being members of a gospel church (71). We should stop laughing about preachers who have three divisions. Three-point sermons have been a very good teaching tool through the centuries (84). Sharpen the arrow! Carefully prepare your sermon’s conclusion! Write down precisely what you want to leave ringing in people’s ears (88). What people see, they remember (97). Spoken English is simple when (1) we make one point per sentence (2) most of our sentences are about ten words long (3) 90 percent of our words are of one or two syllables (133). Quoting Cicero: The secret of rhetoric is…the pause (137). Dress as a man who has something important to say (140). A man with a message speaks with his whole body, and not just his head and shoulders. The time has come to give the traditional pulpit an honorable burial (142). Conclusion: this book is like a drive through at a steak joint: Short and quick, but solid and healthy. This is an excellent primer for preacher upstarts. This entry was posted in Book Reviews and tagged 2014 Review by Paul Schlehlein. Bookmark the permalink.